A Student guitar program in Central America has asked me for help. For the past 10 years I have been working with Suzuki Communities in El Salvador and Guatemala to help build programs in Central America. The next event I will attend begins 16 days from now in Guatamala City in December. One of the teachers there who works with families in a more remote area has asked for two guitars for his program. A local Houston-area merchant who is supportive of growing guitar programs has agreed to supply the items at the lowest rate he gives to schools. Cordoba 1/4 Sized (w/ gig bag) $135. Cordoba 3/4 sized (w/ gig bag) $ 135. New Strings are also needed. The Southeast Texas Suzuki Association is supporting this initiative and has already helped send violins and other supplies to Central America. Visit their page where you can donate via PayPal or use your Credit Card. Every amount is appreciated! We are working against the clock since the next festival begins in a little over two weeks!! Taylor Swift has 18million subscribers and 7+billion views on YouTube. Wow!! Korean Guitar phenom Sungha Jung has 3million subscribers and 1.5 million views. B.B. King, immortal blues guitarist, is a little more down-to-earth with only 13,000 subscribers and 8 million views. Classical Guitarist David Russell has 7,000 subscribers and nearly 3 million views. And truly, other than post them and share around a little – there hasn’t been anything really done to promote the channel. We’re just that doggone good!!! Well…there may be lots of other channels with over a million views, but I still feel really proud and happy about this. …and Thank You for watching!! Working lots lately on writing and recording. And CD-ing – at least, that’s the plan for where this is all going to end up. It just seemed like sharing a “Lick of the Week” might be a nice project to add to the blend. For the Inaugural Week I present the “Wheaties Warm-Up.” My first teacher, DC area Jazz Great Rick Whitehead gave it to me at my first lesson. I thought it was so cool! This exercise consists of a chromatic scale ascending and then descending on the 1st string. It alternates w/ the Eb on string 2 and the open E, 1st string. Here is the first sequence. After that, you can watch, listen and figure it out. Eb – E – F – E – Eb – E – F# – E – Eb – E – G – E etc….. I first learned this with a pick as a study to improve alternating. It’s also good for fingerstyle right-hand patterns. The video shows PIMI. Try PAMI and other patterns for more fun! And practice. You can and should go beyond the 12th fret. This video does not because to do so made it longer than the 15-second Instagram Limit. Last year in February, I was on my way to a Suzuki Guitar Workshop in Florida when I heard the following news: ‘guitarist Paco de Lucia passed away suddenly from an apparent heart attack while vacationing with his family at the beach in Mexico. He was 66.’ I felt a sense of loss for us as a guitar community. He was such a passionate and fiery player. Through his refinements and fusion of flamenco and jazz harmonies as well as his collaborations with artists including Chick Corea, John McLaughlin and Al DiMeola, he helped make the nylon-string guitar more recognizable to a wider audience. I thought about all of the young guitarists I would be working with over the weekend and wished for a way to share something with them that would remind them of Paco and his contributions to our instrument. ‘Flaming Flamenco’ is an original song created as an introduction to improvisation and to rasgueado technique in a fun format for guitar students. On that weekend in Florida, I saw it as a bridge to offer to the students – a bridge to introduce them to a style solidified and popularized by a guitarist they would never have the chance to meet. We guitarists have *hundreds* of etudes and pieces in the key of Aminor since it utilizes the open bass strings as primary chord roots. 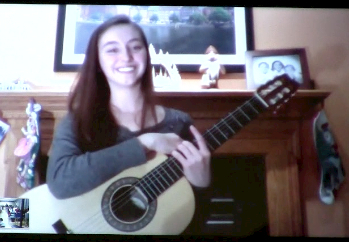 In Flaming Flamenco, students learn the Amin scale as well as two easy and very singable melodies. The accompaniment consists of two repeated chords – Ami and E. Employing a basic rhythm with rasgueados supplies an exercise that builds coordination as well as strength. In a group format, students can pair off and exchange playing the rasgueado accompaniment and the scale with the melodic patterns. It’s pretty much instant gratification! For the performance in Florida, there were parts for every student, the parents and even the audience, too. The beginners were given a rhythmic pattern of hand-claps (or palmas). There was ‘percussion’ using the hands to play on the body of the guitar itself. We closed our portion of the concert with the Paco Tribute. The crowd response was warm and enthusiastic. That brought the weekend to a satisfying close for me. I hope you will enjoy performing this spirited tune in tribute to a legend of the guitar and most of all, grow with your students in the love of playing music on the guitar and sharing with others! In this era of advancing technology, many music teachers are beginning to foray into the Internet Lesson experience. Whether the platform is Skype, FaceTime or another method, it has become a convenient way to monitor students who are out of town, or when they miss due to inclement weather. I have been teaching Internet Lessons a little over a year now. It began when a student whom I’ve taught in out-of-town summer workshops for years asked me for Skype lessons after what was for her a very motivating workshop week. Long story short – We did it! I put them as the first two performers since it was a little bit more time-consuming to connect them. We had a big 27″ iMac desktop in the front which the performer was on via FaceTime. I used external speakers which I also mic’d. After their performance, I re-connected w/ them on a smaller device (iPad and Laptop) and put it on the front row so they could watch the rest of the performers. It was a great success. The connection for those type of lessons is sometimes not ideal and this was the case for the recital performances as well, but afterward both my “live” students and the two from afar were all enthusiastic about the result. After the recital, we even took the devices and let the virtual performers ‘see’ the table spread for the refreshments – which they both thought was fun. Made me feel proud to say “Not Austin – HOUSTON! 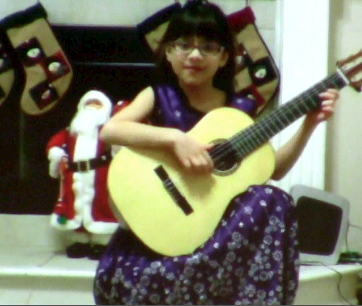 Austin is a very cool place, but we lead Texas in Guitar Recital Internet Technology!” Well, if there was such a thing. It was fun trying something new and feeling it was successful. Yes! 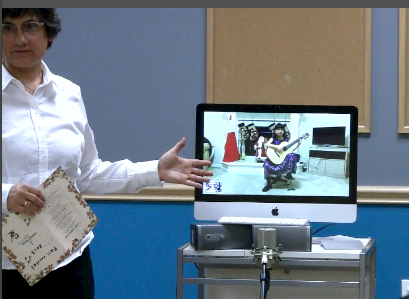 We made Guitar Recital History last night, at least for the first time at that facility – Cypress Creek Community Center – when a recital performance was presented over the Internet in combination with live local students. There was a problem for the Internet Performers who could only enjoy the refreshments virtually, however. Next time we will have to send them some cookies, I guess.